Just wondering if any of the chicken owners here have experience with quail, Japanese / Coturnix in particular? Most the cages I have seen have had wire floors. The argument that it enables the poop to fall through and means the quail don't step in it and get it stuck to their feet. This seems a little daft. Nobody worries about this with chickens, and keeping chickens on wire causes bumblefoot so...? If the poop will cause issues with their feet, what about using a much finer mesh so it should feel nicer on their feet and the poo will still get pushed through?! 1) Anybody who has had quail, is solid flooring okay? I mean, it's not like they had wire flooring in the wild Surely the issue would be not keeping the cage clean or if you squish too many birds into one cage! I've seen lots of quails at petting farms and the butterfly house, and all but one of those were in pens with solid floors. 2) I don't know which cage to use. 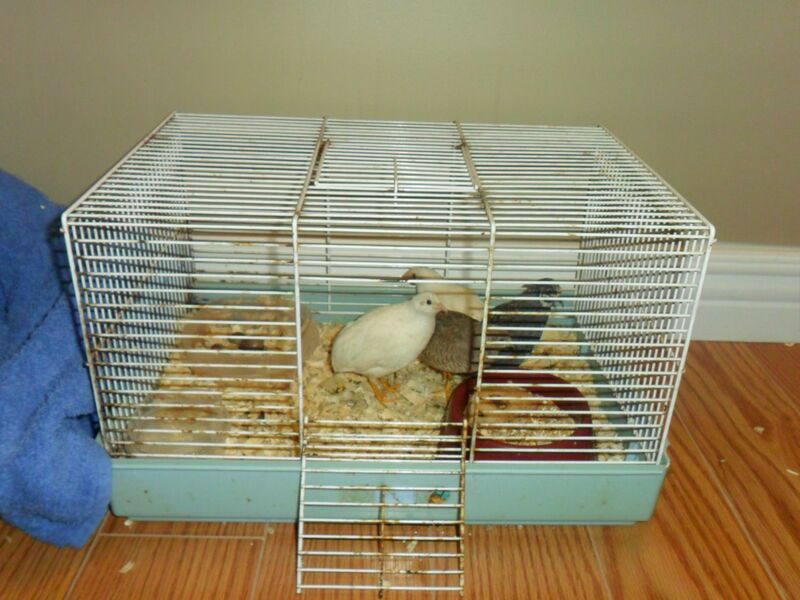 We want two female quails, which means a 2x1 foot cage would be more than adequate. Or I could free up the Furet. That would give us 3.3 square feet, and as it's 80cm high we can do several levels...but is the floor space more important? Would they use levels? The spare Langham we have is the same measurement as the Furet but not as tall, but we couldn't use that because the only decent access is the roof opening, and the quails would freak at being approached from above / could escape! Or, finally, we have a 4x1.5ft rabbit cage we could use, but I don't know where we could put it, it would need covering in mesh as the bar spacing is too wide, and to gain access you lift the entire front up...g'bye quails!! Wood shavings might be a bit messy, and it's a pain to clean. I was wondering about sand or dirt...or cardboard strips?! Newspaper would be easy too, but nothing for them to scrat about in. I'm most interested in either soil or cardboard strips, with a sand pit for bathing. The soil would be easy to do 30% clean outs, turn it over etc. I actually can't find much info on the internet, because most people seem to breed them for meat / eggs and give them the lowest standard of care. Omlet have some info, as does poultrykeeper (which seemed very informative). I googled 'keeping quail pets' and quite a bit came up. Pets At Home had info, but I don't suppose you'd want to buy from them. My friend had two quail and kept them indoors in a run on the floor and let them out in the room. chickens.allotment-garden.org had a lot of info too. I would think a non-mesh floor but with a good substrate would be better for them - although it might mean you'd need to spot-clean more and they are quite messy apparently. We kept quail in a covered aviary outside, ooh, 30 years ago - they're quite cute and make really funny noises! Where the hell are you going to fit them? Every flat surface in your room seems to have a cage on it - guinea pig, hamster, mouse, rat, gerbil-things, big-eared things....?! Must be getting pushed for space! Some one who already has an allotment might be willing to let you have a little bit of space in return for a bit of help digging or watering. Next door to me had quail in an outdoor aviary. No way I would like them in my house though. But hey ho each to his /her own. I thought that too NN. Maybe you could have a walk around and a chat to some of the tenants. Spot ones with a bit of space, or that look a bit unkempt. I think its quite common to keep them on the floor of an aviary - my friend's dad used to breed budgies and had quails too. I hope you can find somewhere to keep them-they don't sound very pet-like and though it would be nice to have some birds again I think you'd be better off keeping the home for more traditional pets!! My Mom and Dad had Quail in the outside aviary. They were Button Quail, very small little birds. They kept sand on the floor of the outside run and shavings on the floor of the inside building they slept in at night. They never had them in the house. We have wild California Quail running around out here, so never thought of having any of them caged.